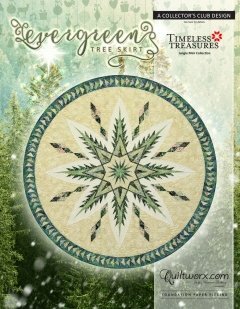 The Evergreen Tree Skirt layout includes two distinct groups to create an 70” x 70” tree skirt. A circular center sits in the middle of the quilt with a diameter of 62”. A 4” Wide ring surrounds the center for a total increased diameter of 70”. This pattern was created by Quiltworx as a limited release project to show the fabulous green palette we incorporated into the Jungle Mini Collection.